(Nanowerk News) Water, an increasingly precious commodity on Earth, has always been priceless in space; but “priceless” is a figure of speech—water in space does have a price, and it is an expensive one. A single gallon of water costs over $83,000 to launch just into low-Earth orbit. Despite recent NASA innovations that allow astronauts to derive potable water from their own sweat and urine and technologies that may one day extract water from buried glaciers on Mars, the availability of water in space is not likely to exceed its necessity. This means methods for recycling and purifying water remain a top concern for the Space Program. NASA’s Johnson Space Center awarded Argonide Corporation, a nanomaterials company, headquartered in Sanford, Florida, a Phase I Small Business Innovation Research (SBIR) contract in 2000 and a Phase II SBIR contract in 2002. Argonide had developed unique filtration media with the potential to revolutionize water purification and provide methods for sanitizing recycled water in space. Working toward a basic tool for water recirculation during long-term space flight, Argonide used its Phase I research to build on its proprietary technology, initially developing laboratory filter discs and syringes. During Phase II, it researched and tested the nanofiber media’s virus filtration properties and its ability to absorb DNA and RNA. Argonide also developed NanoCeram cartridges providing superior purification for drinking water applications. The NanoCeram water filter was an R&D Magazine “R&D 100” award-winning technology in 2002 and was inducted into the Space Foundation’s Space Technology Hall of Fame in 2005. The NanoCeram water filter’s nanoalumina fibers are shown here capturing fumed silica particles of a similar size to viruses. The NanoCeram water filter’s nanoalumina fibers are shown here capturing fumed silica particles of a similar size to viruses. The special ingredients of Argonide’s nonwoven filtration media are nanoalumina fibers made up of the mineral boehmite. 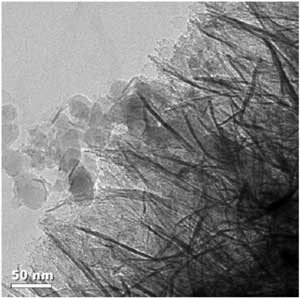 The NanoCeram fibers—each 2 nanometers in diameter and 200–300 nanometers in length (for comparison, a sheet of paper is roughly 100,000 nanometers thick)—are attached to microglass strands. The result looks like nanosize mascara brushes. With a surface area of as much as 500 square meters per gram, the fibers produce an electropositive charge when water flows through them. Many impurities carry a slight negative charge and are thus absorbed by the nanoalumina. A single layer of the resulting media, though it has a pore size of about 2 microns, is capable of removing greater than 99.99 percent of 0.025 micron particles, thanks to this property. (Three layers remove up to 99.9999 percent.) Some of the many impurities the filter media remove are bacteria, viruses, cysts, organic debris, parasites, and dissolved and particulate metals such as iron and lead. Its large pore size relative to the particles it eliminates means the filter achieves the grail of filtration media: high flow with high dirt-holding capacity and low pressure drop. “Our NASA-funded research provided us with information, know-how, and techniques that enabled us to develop our current technology,” says Fred Tepper, Argonide’s founder and president. The filtration capabilities of these NanoCeram PAC cartridges are enhanced by powdered activated carbon. The Disruptor media can retain virtually any nanopowder, adapting to remove specific contaminants from water. Since Argonide’s nanoalumina filtration media was first featured in Spinoff 2004, its production has expanded, thanks to a licensing agreement that has resulted in a host of new applications and recognitions. In 2006, the company exclusively licensed the filter media to Ahlstrom Corporation, a leading specialty paper and nonwoven roll goods manufacturer, headquartered in Finland, with multiple plants and offices in the United States. Ahlstrom began mass-producing and globally promoting the technology under the name Disruptor. Argonide’s SBIR-developed NanoCeram filters are already yielding significant benefits for industrial water filtration and may soon do the same for municipal water supplies. Ahlstrom’s large-scale production capabilities gave Argonide access to mass quantities of the nanofiber roll media for large-scale production of its NanoCeram filter cartridges. It scaled up the size of its cartridges, ultimately producing 4½-inch-diameter by 40-inch-long cartridges, which according to Tepper allowed Argonide to move beyond the retail market and into the industrial and municipal sectors. 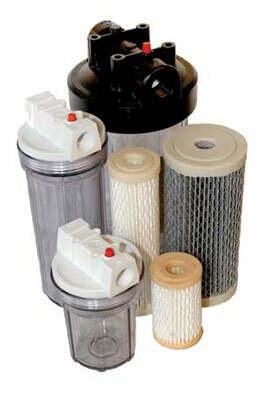 In mid-2007, Argonide’s new NanoCeram filters caught the eye of major automobile manufacturer Toyota. Concerned with reducing the size of its U.S. plants’ “water footprint”—the amount of water the plants consume—the company had committed to scaling back its water use during manufacturing from the Toyota-standard 900 gallons per car to 300 gallons. In order to purify recycled water, Toyota uses reverse osmosis (RO) membranes, which tend to foul easily, even with the use of standard prefilters. Toyota was using prefilters that let through too many RO-membrane-fouling particles; in one plant, this required the expensive membranes to be replaced every 2 to 3 months. Since utilizing the NanoCeram cartridges as prefilters in that plant, the RO membranes have yet to require cleaning or replacement. Toyota has also used NanoCeram filters to cleanse the roughly 16 miles of chill water pipes in a typical plant. The filters have solved a long-standing corrosion problem by removing its cause: iron oxide and the bacteria that feeds on it. Argonide’s filtration media continues to evolve. Ahlstrom is now producing the nanoalumina media with a new component: powdered activated carbon (PAC), which is retained by the nanofibers and enhances the media’s filtration abilities even further. The Disruptor PAC media, which Argonide uses to create its NanoCeram PAC cartridges, has been certified for the purification of drinking water by NSF International, a nonprofit, nongovernmental group that certifies products for public health and safety. Tepper notes that the nanoalumina media can retain virtually any nanopowder desired, meaning it can be adapted to remove specific contaminants from water. That kind of efficiency and versatility has the nanofiber media poised to be a major player in a number of burgeoning applications. Tepper expects that, by 2011, the U.S. Environmental Protection Agency (EPA) will require municipalities to monitor their water for viruses. (Currently, only bacteria monitoring is required, though Tepper says viruses cause roughly 50 percent of waterborne gastrointestinal illnesses.) The EPA has expressed satisfaction with the NanoCeram filter as a virus sample collector in such a monitoring capacity. In addition, “The desalination business is growing by leaps and bounds,” says Tepper, who points out that the RO membranes used in extracting fresh water from our planet’s oceans will benefit, like Toyota’s, from NanoCeram prefilters that remove the cellular material that causes membrane biofouling. And, he notes, all municipal water ultimately will be RO treated as well, providing another opportunity for Argonide and NASA to benefit Earth’s water supplies.